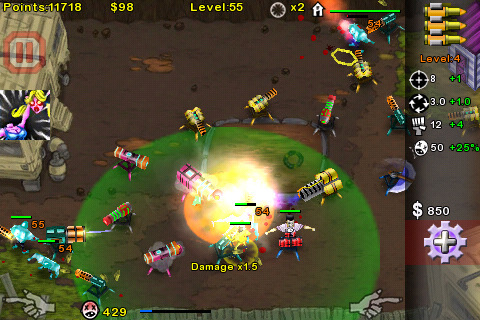 As one of the early tower defense games on the iPhone, Zombie Attack quickly became a cult favorite. The story of one man’s survival against a zombie invasion is something we could all get behind. But despite a fresh approach to the genre and all of that undead-hacking fun, the original game ultimately lacked a lot of variety with one small map and only four turret types. Zombie Attack: The Second Wave takes those concerns to heart and offers a vastly superior offering for those looking to fight off a legion of re-animated corpses. Like its predecessor, Zombie Attack: The Second Wave will place you in the shoes of a zombie invasion survivor. You’ll be tasked with protecting a building from the undead horde. What sets the Zombie Attack series apart from other iPhone tower defense games is that your survivor will have to manually place and upgrade the turrets. You can’t simply swipe around the screen with a high omnipotent finger placing units willy nilly. You’ll need to safely guide your survivor past the oncoming monsters if you want to place that gun turret just right, or upgrade that cannon to maximum ferocity. New turrets join old favourites and add a little bit of whimsy to this terror-filled TD. Scarecrows will attract zombies to their location and blow up in their faces. A giant hammer will pound back and forth trying to smash any zombies that get in its way. A ray gun will send out a space age sonic pulse that will slow the shuffling feet of the undead. Mix in Zombie Attack staples like saw blades and flamethrowers and you’ve got a fairly decent assortment of weapons at your disposal, which is good, as you’ll need them to tackle an assortment of new enemies. The original Zombie Attack offered a fairly generic, repetitive experience in terms of enemy units. While the game boasted two zombie types, it was hard to ever notice a difference. This time around IUGO has introduced a slew of new baddies to tackle. Cheerleaders can use their heads as projectiles. Winged beasts are immune to a variety of turrets. Hounds lock on to the survivor and go for the throat. The Second Wave offers 6 zombie types, which is more than enough to help keep things fresh and a definite change from what’s come before. Tools of death and types of terror aren’t the only thing to see an increase in Zombie Attack: The Second Wave – the map situation has taken a drastic step forward, going from only one map to four. The maps aren’t just greater in number, they’re also better by design. Larger areas mean you’ll need to scroll around the playfield to see every inch of zombie territory, and different map layouts mean there will be different obstacles that you can try and exploit. Each of these areas showcases a different location like a backyard or a trailer park. It’s a nice touch, but at the end of the day what makes these maps a success isn’t whether or not you’re navigating a spooky graveyard or an abandoned highway, it’s how different each of these levels plays. If you grow tired of playing these different maps in the standard Survival Mode, you can check out the surprisingly robust Challenge Mode. You’ll select from 20 different challenges (5 for each map) that offer up some twists on the series tried and true survival gameplay. One challenge may restrict you to using certain turrets. Another may speed up the movement of the zombie horde. With 20 in all, there’s enough here to keep any tower defense fan occupied for days. Zombie Attack: The Second Wave retains everything that made the original a cult classic while at the same time offering a drastically more robust package than its predecessor. 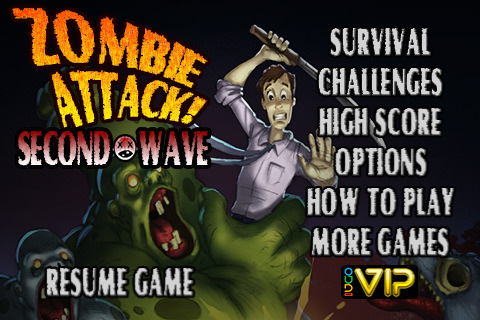 If you were a fan of the original, Zombie Attack: The Second Wave is pretty much a no brainer. As for tower defense fans that found the original a little too shallow, the depth of content offered here definitely makes this franchise worthy of a second look. 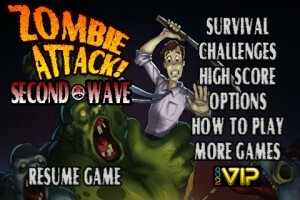 With all of the new additions and improved gameplay, it’s hard to not fall in love with Zombie Attack: The Second Wave. I can’t remember the last time I had this much fun killing zombies with saw blades.